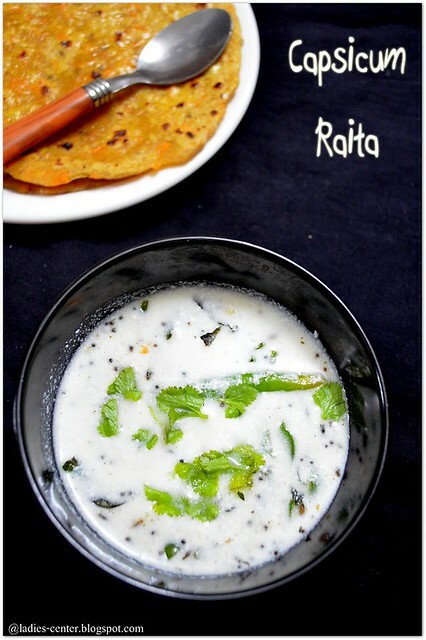 Capsicum raita is the best accompaniment for variety chapathis and parathas. I prepared it for carrot chapathi. I thought of having carrot chapathi as such since it was tasty enough to have it without side dish. But my hubby asked me to prepare onion raita for it. When I opened the fridge to take the curry leaves, I saw the cute capsicum sitting in the side. I immediately got an idea to prepare capsicum raita instead of routine onion raita. I am a fan of capsicum and now for capsicum raita too. It is very easy to prepare and healthy raita recipe. The flavor is so good and it has nice aroma. 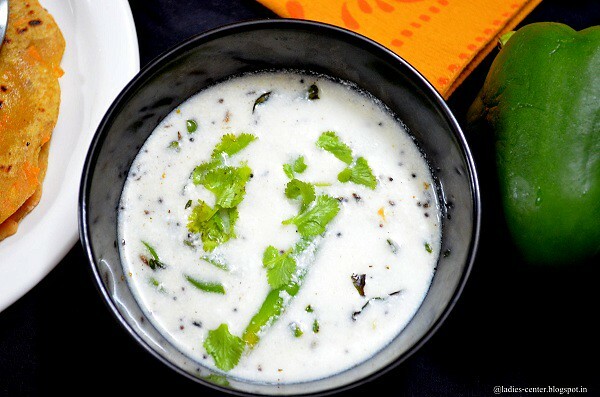 Capsicum raita is a must try raita recipe for all raita and capsicum lovers. 1. Beat the curd. Heat oil in a pan. Add mustard seeds and allow it to splutter. 2. Add urad dal, cumin seeds, green chilli, hing and curry leaves. Saute till the urad dal turns golden brown color. 3. Add capsicum cubes and saute till they are semi cooked. 4. Add the tempered items along with capsicum to the beaten curd. Add required salt and mix well. Capsicum raita is ready to serve with roti/chapathis and parathas. 1. You can sprinkle little chat masala powder or garam masala powder. 2. Take out the green chillies and serve for kids as they might accidentally bite them. 2. You can grate a small carrot and add it to the raita. Hope you liked the capsicum raita recipe.